You'll be £8.99 closer to your next £10.00 credit when you purchase Monte Cassino: Amoured Forces in the Battle for the Gustav Line. What's this? The battles fought between the Allied armies and the German Wehrmacht at Monte Cassino in 1944 were key episodes in the protracted Italian campaign, and the eventual Allied victory was a decisive step in the wider war to liberate Europe from German occupation. 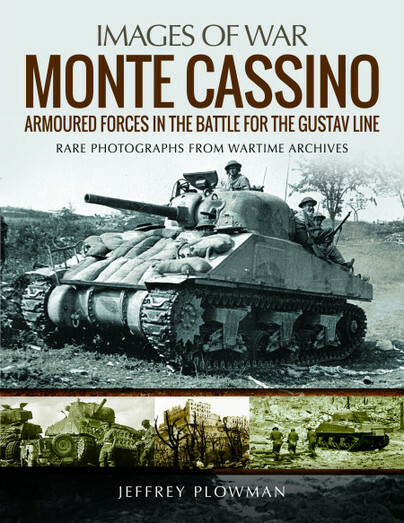 Much has been written about Cassino, but few books have chosen to tell the story through photographs – to give a visual insight into the fighting and the forces involved, the conditions in which they fought, and the landscape around the Monte Cassino abbey which became a battlefield. That is why Jeffrey Plowman's photographic history is of such value. Using almost 200 wartime images, many of which have not been published before, he gives a graphic impression of the realities of the fighting as it was experienced by the troops on the ground. He focuses on the tanks – the array of armoured vehicles deployed by both sides which played a critical role. This aspect of Cassino has rarely been covered in such detail and in such a vivid way. The book will be of special interest to modellers and historians of armoured warfare, but it will also appeal to readers who have a more general interest in the Italian campaign. A superb book by Jeffrey Plowman which takes us through the nightmare of the Battle of Monte Casino in 1944. A very well written, informative, and well laid out book which gives a wealth of detail and, with the high quality images, would make it easy to locate the various actions even today. On the basis of the quality of the photographs, this book is highly recommended to anyone with an interest in the Italian campaign of the Second World War, and the use of armour in that war. Like all of the books in this series the photos provide some excellent ideas and examples for scale model builders and dioramas of that area and time. Highly recommended! The photographs come from a wide range of sources including national archives, veterans, private individuals and the author’s own collection. The amount of information provided for each photograph is exceptional. Invariably the caption shows the exact location, the date, the unit and very often the names of individual crew members... This book is a particularly good example of Pen & Sword’s excellent ‘Images of War’ series and I commend the author for building such a comprehensive portfolio of fascinating images. Another addition to the prolific Images of War series, and another from author Jeffrey Plowman. Perhaps the most famous battle to take place during the Italian campaign, there remains a degree of controversy over the degree of bombing the Allies delivered on both the town of Casino and the Abbey that dominated the heights above it. This particular book though concentrates on the use of armour in the extended fighting which took place in the town and surrounding areas as the Allies sought to break through the Gustav Line.